Perfect as an appetizer or even a light dinner, this garlic shrimp with Sriracha sauce is easy to make and full of flavor. Serve with toasted bread slices! We have been on a “shrimp kick” in my house lately and I wanted to try something different than another shrimp scampi and we had just had my shrimp and pesto crostini at a party last weekend. I asked my son if he was up for something spicier and he was all for it! 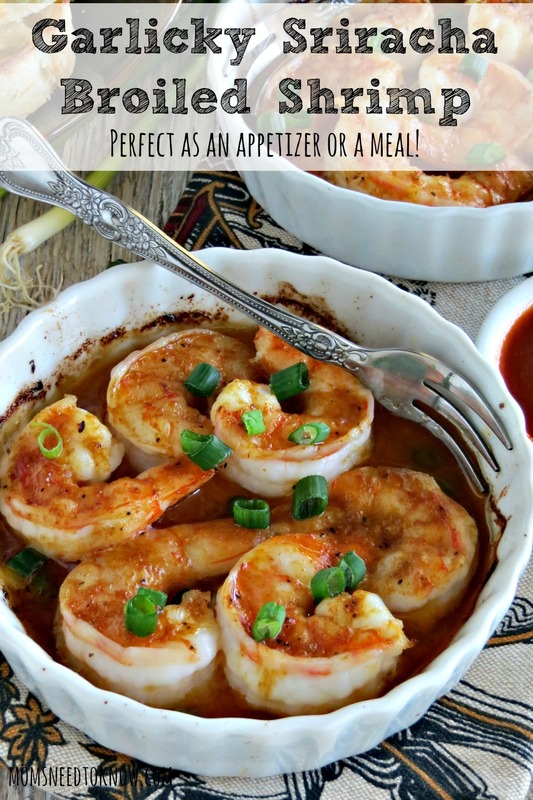 I'm glad he was because this garlic shrimp with Sriracha sauce is nothing sort of fabulous! 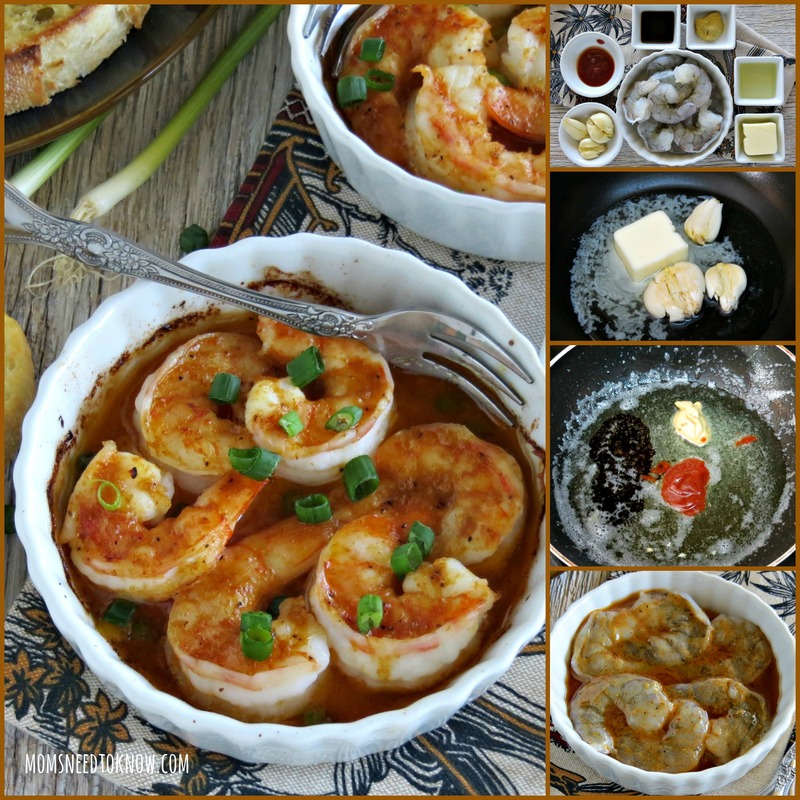 My son said he liked it even more than my copycat Bonefish Grill Bang Bang Shrimp recipe! As fancy as this recipe may seem, it's incredibly quick and easy. In the time it took my oven to heat up to the broil setting, I had the shrimp ready to go in the ramekins. If you buy the shrimp already peeled and de-veined, it's even easier! In the mood for seafood? 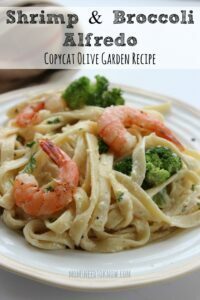 Try this Shrimp and Broccoli Alfredo recipe! By heating the garlic in the butter you are able to give the butter a garlicky kick without the risk of burning it while the shrimp is broiling. When garlic burns, it becomes very bitter and ruins whatever it's in! The shrimp will still be sizzling when you take it out of the oven, so it will continue to cook. Be sure to not overcook your shrimp or it will be tough. We used two teaspoons of Sriracha, which was a medium heat level. If you like things extra spicy, just taste the sauce when it's done and add more to your liking. If I were making it just for me (instead of my son as well, I probably would use 3 teaspoons of Sriracha! You could sprinkle this with fresh herbs, which would make it even better. If I added anything, cilantro would be my choice. It just makes the flavors “pop”! Add the butter, olive oil, and garlic cloves to a small pan over medium-low heat. Let this hang out while you prepare the shrimp. If it appears to be too hot or the garlic starts to brown, turn the heat down. Peel and devein your shrimp. Thoroughly dry them with paper towels and set aside. Remove the garlic from the butter mixture and remove the pan from the heat. Add the Worcestershire, Dijon, and Sriracha sauce and whisk to combine. Set aside to cool. Spray two 6-inch, oven-safe ramekins with nonstick cooking spray and arrange the shrimp in a single layer. Once the sauce has cooled, liberally brush the shrimp with the sauce, making sure to use it all. Place the ramekins on a baking sheet and place the pan in the oven on the highest rack, which should be about 4" under the broiler. Broil for 3 - 4 minutes or until the shrimp is opaque and firm. Do not overcook! Remove the pan from the oven and carefully remove the ramekins from the pan. Sprinkle with a few green onions and serve with some toasted bread to dip in the sauce. Enjoy! Looks delicious- I love seafood! Pinned! Those shrimp look PERFECT!!! So succulent and HUGE!! I can’t wait to try this! Thanks for linking up with What’s Cookin’ Wednesday! Omgosh, so much yum! I absolutely love shrimp and this looks delicious. (Definitely need to check out your other shrimp recipes, too, because they look equally delicious). Thanks for sharing your recipe with us at Merry Monday this week! That looks delicious. We love anything sriracha.